“An American Dream?” is the work of eight amazing women who met, learned, cried, laughed and worked together to produce powerful portraits of courage and resiliency. These photographs and narratives are organized around themes that the group found it important to address in their research: the living conditions that families are forced to endure, their impact on health and wellbeing, fear of eviction and ending up on the streets, the fires and displacement occurring in the Mission, resiliency and hope, and potential changes and solutions. In this photo, my husband was taking the opportunity to open the garage door so that we can have some fresh air in our home. Because we were fearful that the neighbors would realize that we were housed illegally, we only opened the door for a few minutes. We could not stand the smell of humidity and mosquitoes. This was the reality of our housing conditions. My family and I slipped often because the cement floor remained constantly wet. We had to be very careful when walking around. My daughter felt frustrated because she wasn’t allowed to play when the ground was slippery. The drip of the water heater was dirty and created an unpleasant smell. Because there are limited resources for families who had been evicted, like us, we had to put up with this living situation. 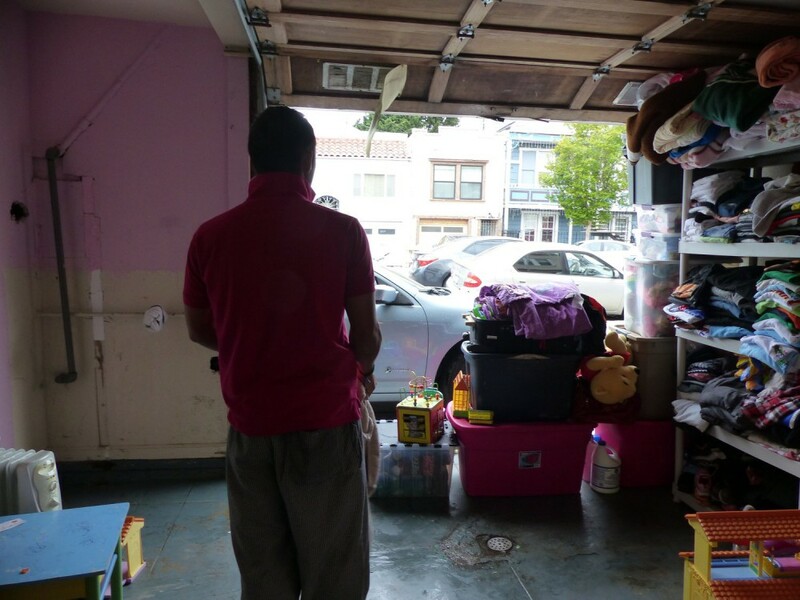 In the end, living in a garage was a better choice than living in a car. I think there should be more funding for subsidized housing in order to help homeless families. In addition, there must be greater news coverage of how the high cost of rent is causing homelessness.